Some dural AVMs – those that do not cause symptoms and do not appear likely to hemorrhage– can be monitored without treatment. The current treatment of choice for dural AVMs is endovascular embolization, which involves the insertion of a catheter, or tube, through an artery in the groin. The tube is guided through the circulatory system to the site of the dural AVM, where it delivers a kind of “glue” that embolizes, or blocks, the malformation to bypass it and restore normal circulation. 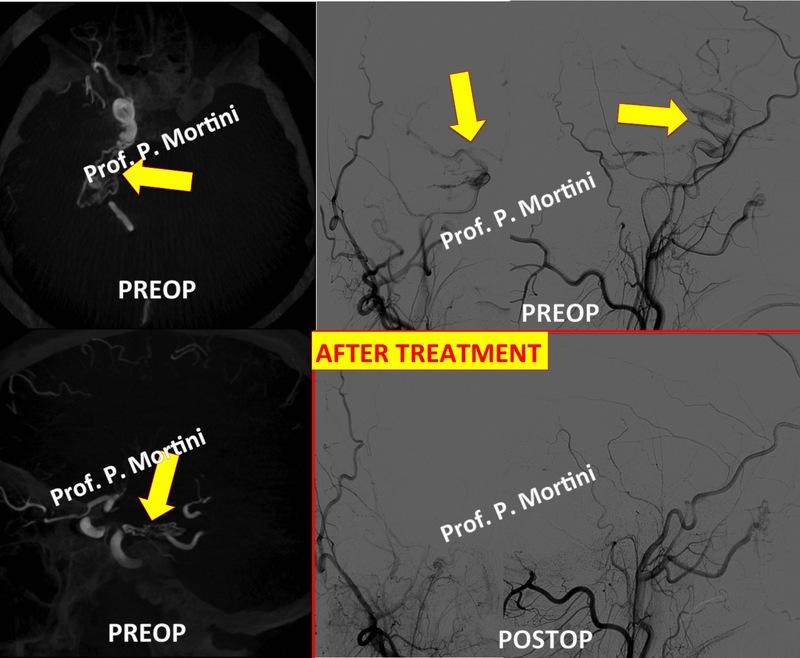 After embolization, the microsurgical resection of the dural AVM, in which surgeons remove the abnormal vessels, may be more successful. In cases in which the risk of hemorrhage is high, or in which the catheter cannot reach the AVM, treatment may involve only surgical resection. Stereotactic radiosurgery (highly focused radiation) also may be used in specific cases.